At StickerYou, we have a wide variety of custom decals - sometimes, it can be hard to choose which is best for your purpose. Regardless of what you choose, you can order our custom decals in any size, shape, any quantity. From windows and walls to floors or ceilings, any surface is possible! 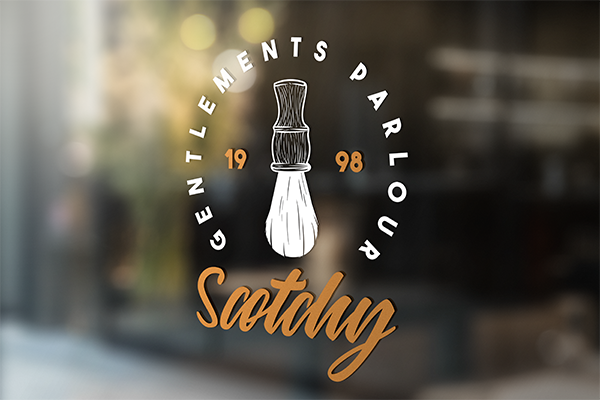 Now let’s go through the different types of decals, to help you decide which is perfect for your business, retail space, or personal expression. If you have an office, room, or plain wall that you need to customize, logo wall decals are a great option. These decals work well on indoor smooth wall surfaces, and use an adhesive that is strong and will stay put. Not only this, but when it comes time to remove the decal, it won’t leave behind and residue or pull up any wall paint! Logo wall decals are a single die-cut shape, and can be contour cut around your design. You can also customize the padding/background colour to match the wall that it will be applied to, to ensure it blends in as well as possible! You’ll never have a boring, empty wall again thanks to logo wall decals! Want to add style or flare to your business or home windows? Clear decals are the perfect option. These decals will also arrive in one piece, and adhere using a bubble-free technology to ensure a smooth application, everytime! If you’re not wanting any adhesive on the decals, you can also order static clings to apply your decals to a glass surface using electricity. All of our clear decals are printed with a white ink undercoat, to ensure your logo/branding prints with a vibrant, solid finish. They’re also weather durable, making them a great option for signage and branding facing an outdoor window. Promote your sale, solidify your mission statement, or get your branding on point with clear decals. With StickerYou’s custom floor decals, you can ensure you use every bit of real estate you have available to get your message across. From signage to advertising, these decals are great for any business, home, or event! Our floor decals apply smooth, stick great, and are also slip resistant to keep safety top-of-mind. We also offer both indoor floor decals and street decals, to ensure you get the perfect material for the surface you have in mind. Our indoor floor decals are perfect for any indoor smooth floor, and can even be used on low pile carpet (making them perfect for tradeshows and networking events). 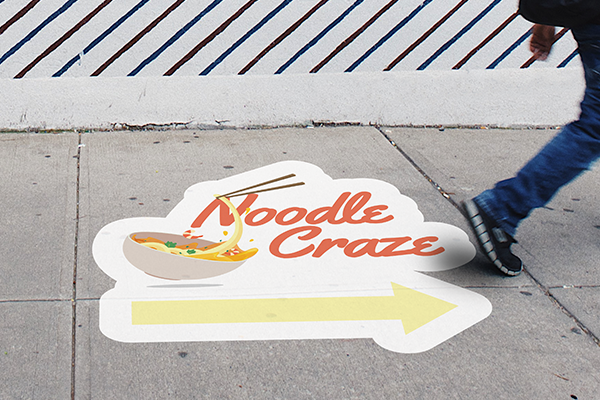 If you have a rougher surface or want to use your decals outdoors, street decals are a great way to call in pedestrian and vehicular traffic. All of our floor decals are laminated in order to protect the ink and ensure you receive the highest of quality! Achieve a professional and pristine look with StickerYou’s vinyl graphics. 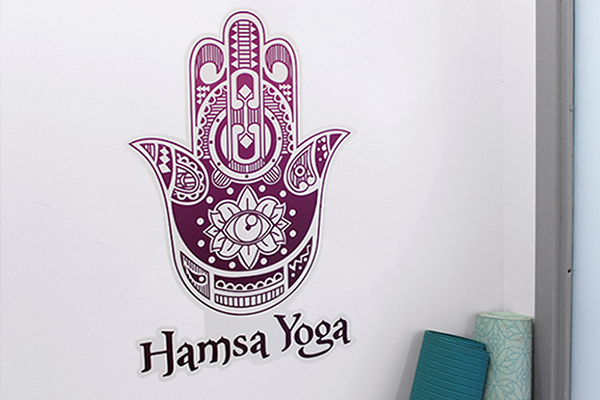 These decals are great for store-fronts, car windows, and signage, and have an extremely flexible use case. As long as the surface you’re applying to is smooth, these decals will stick. Vinyl window and wall graphics are printed on removable white vinyl and masked using a laminator, so they can be die-cut around each individual element of your design. We also sometimes refer to them as “true” decals, as they are the most authentic version of a decal. Due to their multi die-cut nature, they will need to be placed as a custom order. If you’d like to order one, you can send your artwork (in vector format if possible!) to our team at [email protected]. We will be able to supply a quote, and get you a custom proof. Our vinyl lettering is a great way to enhance your walls and windows, or liven up any space. Our vinyl lettering decals are super easy to apply - they are masked and arrive on transfer paper, just like our vinyl graphics. 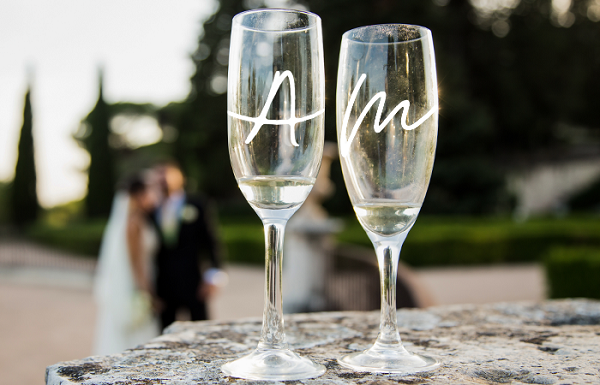 We have an amazing Vinyl Lettering Editor, which allows you to choose your font, size, and colour, and create your own custom lettering directly on our website! These individually die-cut letters will stay in place regardless of weather conditions, as they are waterproof and very durable. 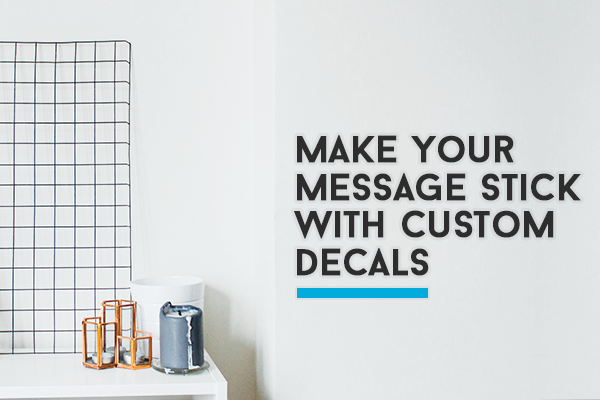 It’s never been easier to make your message stick!